First, get a car with good multiplier and skill point perks, like the 5 Turbo Forza Edition. Then, travel to the Bamburgh Castle on the east coast, at the following location. Next to the beach is a huge bumpy uneven area that you can use to farm as many skill points and influence as desired. Simply drive back and forth while jumping, drifting, and destroying to quickly gain points. You can get 200,000 skill points every 60 seconds using this method. One of the easiest methods to quickly get skill points is to unlock skill songs. This can be done by purchasing the Huntsman's Lodge for 750,000 credits. This house comes with three free super wheel spins and the skill song perk. After this perk is unlocked, radio stations will play skill songs that increase your points gained and allow your multiplier to reach 10x. Make sure to switch through all radio stations to find skill songs more frequently. To automatically earn up to 12,000 daily credits, drive northeast to the "World's Fastest Rentals" business chapters. Just like the other story chapters in the game, there are ten chapters you can earn stars from. The more stars you get, the more daily income you earn. Each day you will get credits transferred to your balance automatically. These business payouts can be viewed in the menu under the message center. You can earn up to 12,000 credits each day by completing all ten "World's Fastest Rentals" business chapters with three stars each (30 total stars). Fast travel has to be unlocked before you can instantly go to any point on the map. At first, you can only travel to houses that you bought and the festival. To fast travel anywhere on the map, purchase the Fairlawn Manor house for 750,000 credits. It gives you the "Fast Travel Anywhere - Instantly travel to any road on the map" perk. The cost of fast traveling will still be same, but you can lower it by destroying fast travel boards. Once you find all of them, you can fast travel anywhere for free. Go to the indicated locations to find all 15 Barn Finds, including the Spring, Summer, Autumn, and Winter Barn Finds, which can only be found during their indicated season. Note: The Bentley 4-½ Liter Supercharged can only be found after buying the Bamburgh Castle. 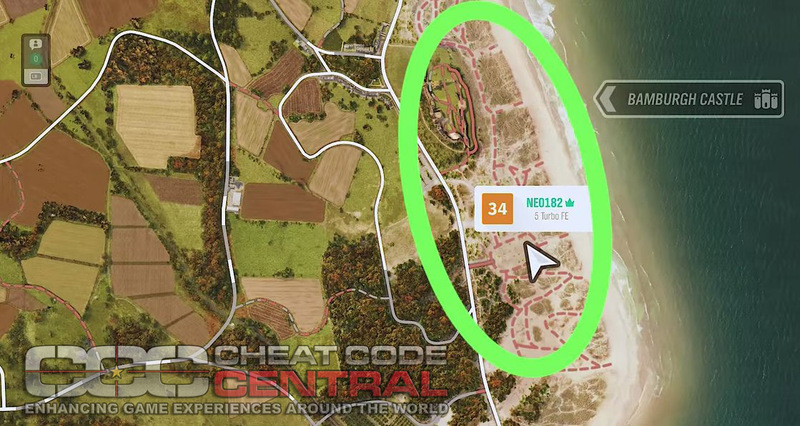 Go to the indicated locations to find all 12 Beauty Spots (shown counter-clockwise around the map, starting north-west) and get the "Taking The Grand Tour" achievement. Go to the indicated locations to find all 12 purchasable homes in the game, which come with the special perks and rewards listed below. The first house ("The Gables") is free and comes with the Drone mode perk. All other houses have to be bought and range from 200,000 credits to 15,000,000 credits. The following videos shows how to complete all Laracer @ Horizon story chapters with three stars. This event allows you to drive cars from classic racing games like Crazy Taxi, Project Gotham Racing, and Ridge Racer. Welcome to Britain (10 points): Arrive at the Horizon Festival. Pride Before the Fall (10 points): Qualify for Horizon Autumn. Snow Problem (10 points): Qualify for Horizon Winter. Optional Extras (10 points): Apply your first Car Mastery. Spring Into Action (10 points): Qualify for Horizon Spring. Welcome to a New Horizon (30 points): Qualify for the Horizon Roster. Jolly Cooperation (20 points): Complete 5 Horizon Life Co-op Races. Human After All (20 points): Complete 5 PvP Races. There's No 'I' in Team (10 points): Take part in your first #FORZATHON Live Event. Teamwork Makes the Dream Work (20 points): Complete Round 3 of a #FORZATHON Live Event. Life of the Party (30 points): Take part in 20 #FORZATHON Live Events, completing at least Round 1 in each. Whatever Next? (20 points): Complete every Showcase Event. Colossus of Roads (20 points): Reach Round 10 in the Horizon Road Racing Series. Muddied (20 points): Reach Round 10 in the Horizon Dirt Racing Series. Bouncy Bouncy, Having Such a Good Time! (20 points): Reach Round 10 in the Horizon Cross Country Series. I Live My Life... (20 points): Reach Round 10 in the Horizon Drag Racing Series. Moonlighting (20 points): Reach Round 10 of Street Scene. Horizon Fashion Week (20 points): Unlock 100 clothing items for your character. Official Horizon Board Game (20 points): Smash all 200 Bonus Boards. I Feel the Need (10 points): Reach Speed Trap Hero level 10. Apex Predator (10 points): Reach Speed Zone Hero level 10. Pilot's License (10 points): Reach Danger Sign Hero level 10. "Do you know what 'DK' stands for?" (10 points): Reach level 10 in The Drift Run. Auto Barn (10 points): Find and restore your first Barn Find. Antique Restorer (20 points): Find and restore 15 Barn Finds. Taking the Grand Tour (20 points): View every Beauty Spot. An Illustrious Career (20 points): Finish 40 different Horizon Story chapters. Star Centurion (50 points): Get 100 stars in Horizon Stories. Week Complete (10 points): Complete a #FORZATHON Weekly Challenge. Crowning Achievement (20 points): Purchase a castle. Special Edition (10 points): Get your first Forza Edition Car from a Wheelspin. Test your Might (20 points): Complete The Trial. First-Time Adventurer (10 points): Complete your first Team Adventure. The Spirit of Adventure (20 points): Reach level 5 in Racing Team Adventure, Games Team Adventure, or Anything Goes Team Adventure. Certified Adventurer (20 points): Qualify for a League in Ranked Team Adventure. Well Seasoned (10 points): Complete a Season Championship and receive a reward. Overachiever (10 points): Complete a Season PR Stunt and receive a reward. Purple Split! (10 points): In Rivals, beat a Rival without receiving a "dirty time" penalty. Hit the Jackpot (10 points): Spin your first Super Wheelspin. Stunt Superhero (50 points): Get 3 stars on every PR Stunt. First Love (10 points): Buy your first car from the Autoshow. Go the Distance (20 points): Win a race at The Colossus, The Gauntlet, The Titan or The Marathon. The Noisy Cartographer (20 points): Drive down every road in Britain. At One with the Car (10 points): Apply every Car Mastery available for a single car. Master of Many (20 points): Apply 50 Car Masteries. Accomplished Driver (10 points): Reach Level 20. Horizon Superstar (50 points): Gain Superstar Status by reaching Level 200. Reaping the Rewards (20 points): Complete a race of 3 or more laps at The Goliath in a Forza Edition Car. Tortoise and the Hare (20 points): Complete a PvP Showdown Race in an X class and a D class car. Hatch Me If You Can (20 points): Complete the Festival Drag Strip in a Hot Hatch in under 25 seconds. Record Breaker (20 points): Get 258mph on a Speed Trap in the Bugatti Veyron Super Sport. Ground Force (20 points): Get 3 stars at a Danger Sign in a vehicle from the Trucks Car Type. Coronation Trickin' (20 points): Bank a Skill Chain of 195,300 or more points. Never Tell Me the Odds (20 points): Win a race in the Peel P50. Tame the Monster (20 points): Complete a race in an S1 class Rally Monster.